Total walk length: circa 12 km (7.5 miles) Terrain: generally a mixture of hard paths and field paths. The route can be muddy after wet weather. WALKING BOOTS and rain jacket a must for this walk. For advice on clothing see here. Cost: £8 for members of Cranfield University’s walking society, non-members £12 (includes transport, cost of educational visit & lunch). Book your place at the Cranfield Students’ Association’s office, 1st floor by Tuesday 25 October Show you membership card to claim a discounted rate when booking a place. A special guided walk by Andrew Foley, National Trust Ranger. 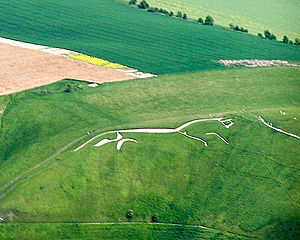 Come and see the oldest chalk figure in England, dating back 3000 years. This entry was posted in Blog, Walks and tagged a hike, across the downs, chalk figure, challenging walk, National Trust, Oxfordshire, White Horse Hill. Please remember that on Sunday 30th October at 2.00 AM the clocks in the UK are changed back to 1.00 AM – from British Summer Time to Greenwich Mean Time (GMT) until March 2012. Since they go back 1 hour, the people who forget may arrive 1 hour early for this meeting at 8 AM. I always try and remember to change my watch when I go to bed, my laptop changes automatically.